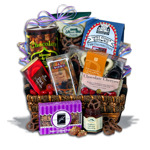 Fun gift baskets are an all-time favorite and come in an endless variety of themes! Filled with many little surprises, they are easy ways to give something you know they will love! Why are gift baskets such a cool gift? For many reasons! ... so you know you will have an instant hit on your hands if you think about how they love to spend their spare time or weekends! Do they play sports? Love to host barbecues? Have a sweet spot for chocolate? Gourmet Foods? The ideas are absolutely endless! Gift Baskets are extended fun for your recipient as they discover each little item related to the them you choose for them! 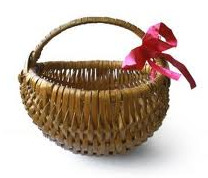 You can easily make a homemade basket with your own personal touch too! Your efforts to creatively make a gift designed with only them in mind will make your recipient feel so special and loved! If you are short on time though or just want something easy, fun gift baskets you buy are just as special and exciting! Make Your Own Gift Basket! A personalized mug and t-shirt with the pet's picture or their picture together on it! Socks, pajamas, slippers, t-shirts, sweatshirts, or a throw blanket with an image of their pet's breed on the print! A dvd with a movie featuring their pet's breed or centered around an animal character (such as All Dogs Go To Heaven, Lady and The Tramp, Milo and Otis, Beethoven, etc.)! A piece of jewelry with teir pet's name engraved on it or their pet's breed as the charm! A framed picture of them and their pet! A cute outfit or collar for their pet! A magazine about their pet's breed! Blank canvases, acrylic paints, and paintbrushes! All kinds of art, craft, or sewing supplies! A gift certificate to a local art store! Some certificates for local art classes in painting or pottery! A bathrobe (have it personalized for an extra touch)! Bath salts and bubble bath! Candles and a relaxing music cd! Sweet aromas in body wash, lotions, sprays, and perfumes! Shampoo, conditioner, and a hairbrush! Current new york best sellers! A book store gift certificate! A new apron personalized with their name or initials! A new kitchen accessory that will make their life easier! Gift certificates to their favorite fashion stores! Stylish apparel and accessories you know matches their tastes! Jewelry (have it engraved or personalized with their birthstone or the birthstones of their children for an extra special touch)! Books or magazines on gardening! Fine cheese from around the world! The best tea and coffees! A set of nice steak knives! A new apron with their name on it! Candy and drink gift certificates! Everyone loves to be pampered. 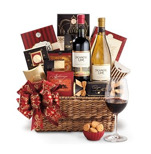 Fun gift baskets can be made from organizer baskets filled with special little items that will entice relaxation, like…. A soft and cozy throw blanket! Massage or spa gift certificates! A bed & breakfast gift certificate! Sunhats and flip flops, or ear muffs and mittens (depending on where they are headed)! Magazines or a book to read! Books and information on the location they will be traveling to! Gift certificates to a winery!